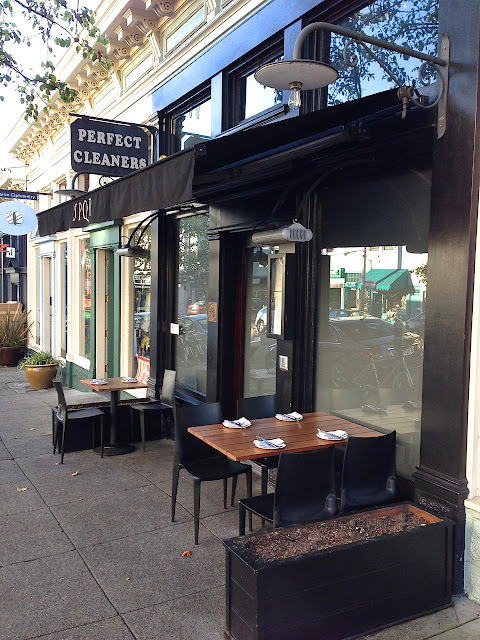 Along the very trendy part of Fillmore Street is a small restaurant/bar helmed by chef Matthew Accarrino. A recipient of one Michelin star, it appears at first glance to be an Italian restaurant (SPQR is a Latin acronym used as a standard during Roman times, meaning "the Senate and People of Rome"), but is in actuality one which specialises in Californian cuisine with an Italian twist. 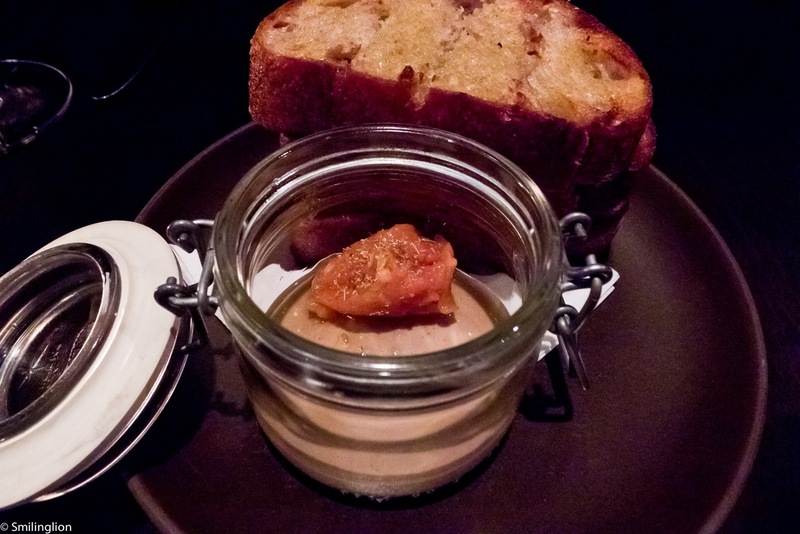 It tends more towards a hip bar than a fine dining restaurant, with its noisy atmosphere, tightly-packed and uncovered tables and bustling service. The evening we were there, the clientele was of the stylish-hip crowd. The menu is designed for sharing and we were recommended to share certain of the more popular dishes from the a la carte menu. We thought it unusual that the wine list was almost exclusively Italian (we couldn't find any Californian wines on the list) and quite expensive. So we had wines by the glass instead. Chicken liver mousse, persimmon conserva and balsamic gelatine: This was very good, especially with the perfectly grilled bread. 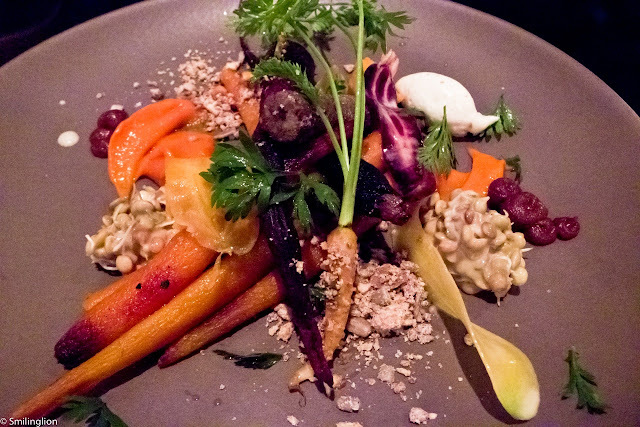 Sweet carrot and lentil salad, medjool date and vadouvan curry creme: Our server strongly recommended this, and said that this tasted a lot better than its description sounded like. She was right, it was a phenomenal salad with the freshest of root vegetables with a very provocative curry flavour. Suckling pork confitura, pickled pepper, chickweed and charred vegetable sauce: This was also a very good appetiser. 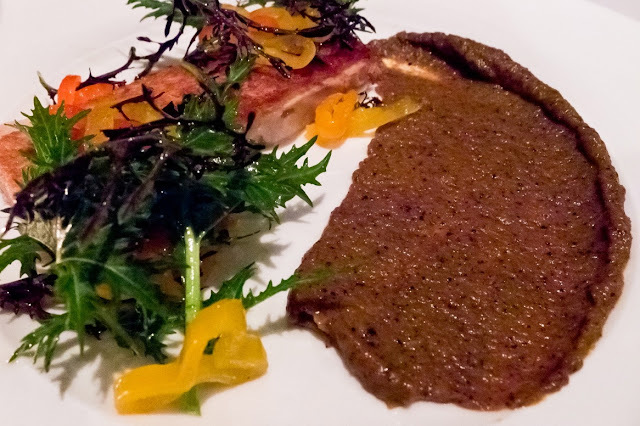 The pork was tender with a crispy skin and the accompanying sauce had a delicious burnt flavour and went very well with the meat. 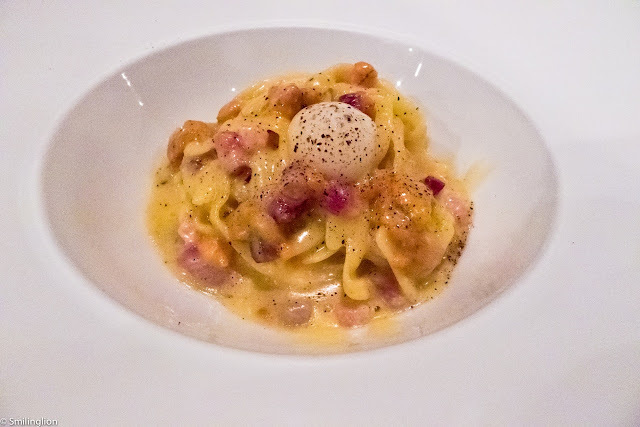 Smoked fettuccini, sea urchin, smoked bacon and soft quail egg: A wonderfully rich and eggy carbonara, the sea urchin was an ingenious addition to the dish. It was a real crowd favourite. Pig's head pyramidi, hakurei turnip and sartori fontina cheese: This was also recommended but we didn't like it as much. 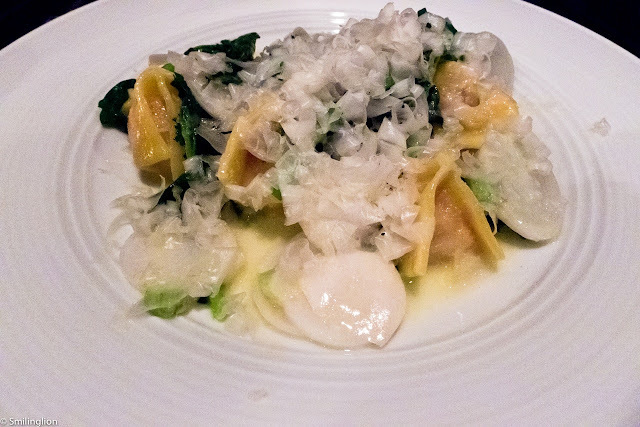 It was too cheesy for our taste, although the turnip and greens added an interesting bitter taste to the dish. 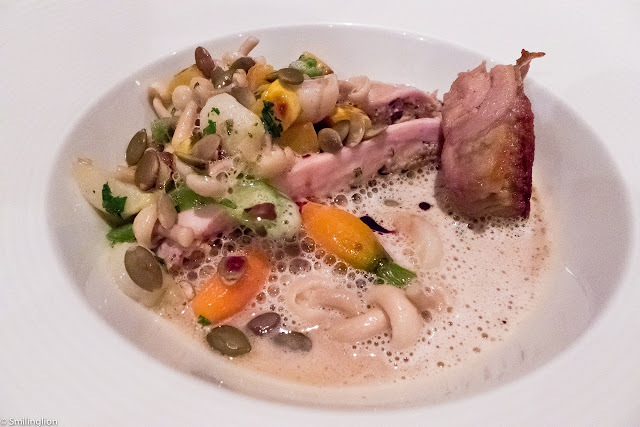 Guinea hen, delicata squash, alba mushroom brodo and pumpkin seed: We loved our main course. The hen was cooked extremely juicy and tender and in a delicious mushroom broth. Together with the carrot salad we had earlier, this was a good example of this restaurant's ability to convert fresh produce into excellent dishes. 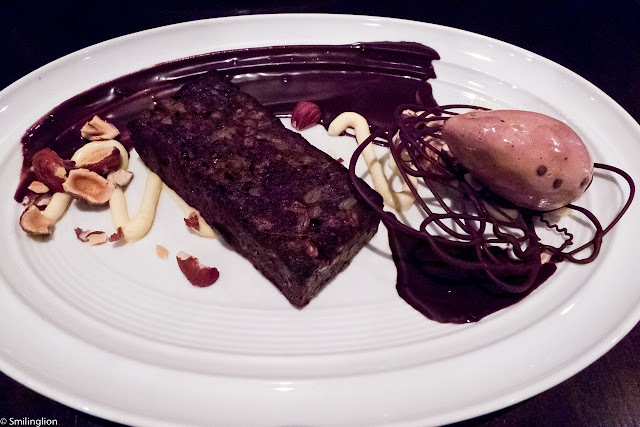 Farro and gianduja chocolate "budino di pane", hazelnut, orange curd and chocolate gelato: We enjoyed this chocolate bread pudding, especially with the hazelnuts which added a crunch to the dessert. Impressions: We had quite a good time here, it was busy and tables get turned quite quickly. Not a place for a leisurely or relaxing meal, it was more a place to see and be seen, but with great food. Service was good, though it was more of the brisk bistro style than the meticulous fine dining one. Pity then about the wine list, which we felt was too limited (and just to Italians only) and expensive.